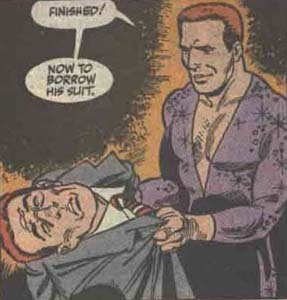 Powers/Abilities: The Dittomaster has the ability to shapeshift, taking on the appearance and voice (but not clothing) of another person, apparently requiring physical contact with his target in order to do so. The true form of the Dittomaster is either that of a beautiful woman, or has not been revealed. The Dittomaster also carried a gun. History: (Damage Control II#4)- The Dittomaster invaded the office of Henry Peter Gyrich at the Commission on Superhuman Activities in the form of a beautiful woman. After seducing Gyrich, the Dittomaster assumed his form, and donned his suit. When Anne Marie Hoag appeared to discuss her problems with the Super-Hero Registration Act the Commission was attempting to move forward, the Dittomaster removed his gun, and attempted to force Hoag to sign the report to ensure that it would be passed, but Hoag smashed the gun into his face, then kicked him in the crotch. The Dittomaster attempted to recover, but found himself ambushed from behind by Nick Fury, and was forced to surrender. Comments: Created by Dwayne McDuffie, Ernie Colon, Stan Drake and Marie Severin. It's possible that Ditto, of Goodman, Lieber, Kurtzburg and Holliway from Dan Slott's She-Hulk is the Dittomaster, having reformed, as they're both shapeshifters, but there's no confirmation.